Shirt or Dress? : Tights are STILL not pants. 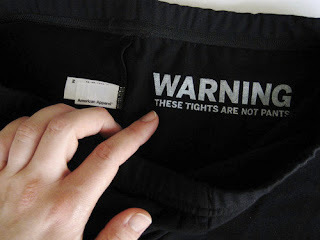 Despite warning from retailers*, people are still wearing tights as pants. Last week at dinner at a casual Mexican restaurant, I saw no less than four girls in 5 minutes wearing what seems to be the "ah! It's below 60 in Atlanta so what do I wear!" outfit. - Tights. Tights That Are NOT Pants but are in fact tights. Not leggings. TIGHTS. Leggings are opaque. - Shirt that isn't tunic length. At least wear a tunic length shirt if you're wearing Tights that are NOT pants. - Uggs over Tights That Are Not Pants. *Yes, that is an American Apparel tag. I'm shocked as well.